Miguel de Palomares was one of the first Catholic priests to come to Mexico, back in the beginning of the 16th century. Within three years of taking over Mexico City, the Spanish had built the country’s first Catholic cathedral, right on the site of an Aztec temple. 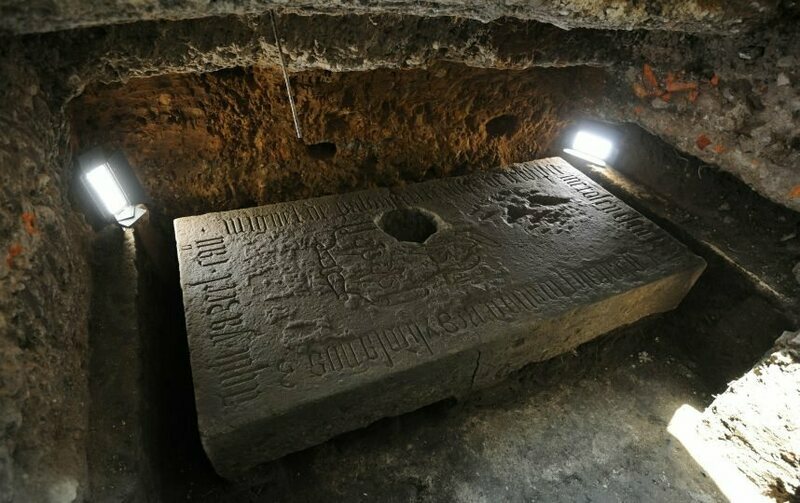 When de Palomeres died, in 1542, that’s where he was buried, underneath a slab of heavy stone. Recently, the Associated Press reports, when a construction crew was digging holes for lamp posts, they came upon that slab. About a century after it was first built, the cathedral had been torn down, to make way for a newer, bigger one, and the site’s old purpose more or less forgotten. At one point, another crew drilled a hole directly down into de Palomeres’ grave. The slab covering it has a large hole drilled into it. The Spanish who conquered Mexico reused Aztec sites—perhaps for the symbolism of building their churches where Aztec temple once stood, perhaps, the AP suggests, out of practicality. The walls and floors of those old temples were well made.